Previous post: Episode 53: Buttons, badges, bright shiny beads. Note: The Brother Amos sock pattern is is now (finally) available! Thanks for your patience. Special thanks this week to contributing writer Katherine Matthews, of Purl Diving, and to my guest, Norah Gaughan, knitwear designer, and author of the fabulous Knitting Nature . Be sure to check out Norah’s latest designs on the Berroco website. Special thanks to Jim, for uploading a copy of XP Home, and to Heather, who made him do that. Cast On has been nominated for Best Podcast in the Bloggers Choice awards! Thanks for nominating me. Go vote now, and I promise not to whore for votes on the next podcast. Thank You Brenda that was much needed……………………….did you say Brother Amos? Just going to cast off the BSJ and get those pointy sticks ready to cast on…………………………..life couldn’t be more perfect. This absolutely makes my weekend!!!!!!!!!!!! With this episode Brenda is really BACK!!! I hear the energy in the voice, the lightness of thought, and the creative juices flowing. Ahhhhhh, I am so thankful. Have already purchased “Imperfect” from Itunes as I think it is a great song! Looking forward to Brother Amos. I just finished my very first sock, so I may actually be able to do the pattern. Welcome back Brenda!!! Brenda, I’m an IT person by profession and I know Windows XP inside and out. If you need help, please feel free to drop me a line. Whoohoo! 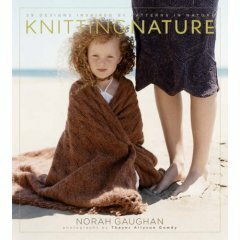 I love Knitting Nature and it was a wonderful surprise to see that Norah Gaughan was your interviewee. Just finished Cold Comfort Farm a few days ago, so I’m looking quite forward to seeing the Brother Amos socks! Of course I voted for you. You are truly the best podcaster EVER! Brenda, I just received the Brother Amos sock pattern in my e-mail. I’m going to have to take some time to read through this, it looks great! Thank you! I’ve can’t download #54. I only get the title then nothing. Any body else having this problem? Just received the Brother Amos sock pattern. Thank you Brenda, it is beautiful!! I appreciate your sharing this pattern with us. And… I went and voted for the podcast! Let’s get those votes up everyone!!! Several people have experienced trouble downloading this episode. There have been problems this last week at libsyn, where the podcast files are hosted. If you’re using iTunes, try unsubscribing from the podcast, and resubscribing. That often works. Or you click the download link above, save the file to your hard drive, and add the file to your iTunes library, via the File menu. Thank you for a) being there & producing a wonderful podcast & b) the brother amos sock pattern -just in time for Ravelry’s Anyomous Sock Knitters September challenge -Toe Up’s!. Must now go & vote! I think I’m an extreme knitting. I snap on my waste pack with 2 balls of sock yarn and go walking while I knit 2 pair of socks at once using the magic loop method. I’m also listening to a podcast (Cast On â€” of course) while I’m walking and knitting! The funny thing is that I’m an English knitter but can only knit Continental while walking. Got to be a right brain/left brain thing. What is the vote and where do I go to do it? Love the podcast – my only sadness is that I have now caught up with all the previous episodes and have to wait to download the next one. Once again Brenda – great podcast. Please, please, please keep them coming. p.s. thanks for the Brother amos sock pattern. Have only tried Opal free sock pattern up to now but maybe this will help me to branch out and try the toe up method! Marian, go to the cast-on.com homepage and click on the Bloggers Choice Awards button (the middle column towards the bottom). It will take you to their site where you can register and cast your vote for Brenda and Cast-on!! No need to bribe me to vote for you. Yours is the gold standard of knitting podcasts. No, I take that back. Of podcasts. I started listening when you were posting intermittently because you weren’t feeling well, and hearing you come back to speed has been inspiring. That’s what knitting does to people. Whiter Shade of Pale gave me goosebumps. Seriously. I was a camper’s aide that summer in upstate New York and watched the moon landing on a little black-and-white set with crappy reception. You brought it all back. Now to go earn some badges! Great episode Brenda! I just love listening to you while I knit! I agree with BJ, Brenda is sounding like her old self again and I couldn’t be happier. Thanks for the song “Code Monkey”. As someone who loves a code monkey, it really rang true! I smiled all the way through it and then bought a copy. I like to camp, but was never part of the Brownies/Campfire Girls etc. so I haven’t been able to relate to this series as much as your previous ones. I like your idea of doing some mini-series as well. When you mentioned extreme knitting, I immediately thought of Sage’s micro crochet stories. I look forward to hearing more. Yay! A podcast! Thanks yet again, and please keep it up! Too many knitting podcasts are discontinued! I was checking iTunes literally every 5 minutes once I thought a podcast might be coming!!! I’m not entirely sure of exactly the time you usually post, and there are variations, so I was in total suspense all day. When I think of extreme knitting, I think of knitting something that you know will take forever, don’t really like, is done on really small needles or with a complex pattern, you don’t enjoy it in the least, but you knit it anyway for someone you care about. Either that or something so extremely out of this world crazy that only someone desperate to make a statement would ever even dream of wearing it. Oops! I think my needles are calling me! I enjoyed Katherine Matthews’ piece. Even after 35ish years I was still able to recite the promise and pledge along with her! P.S. Anyone know how to add a badge to a blogger account? I am LOST!!! Hi Brenda! I voted for you! I wanted to also mention that I have discovered a new band, Nervous But Excited, that seems like something you would like. I went to camp this year (my yearly camp adventure to the Michigan Womyn’s Music Festival) and these girls were so full of energy and so fun to watch, even if their songs are mostly mellow. You’ve asked for us to provide you tips on new music, so I am trying to pay it forward! And you’ve also inspired me to read Cold Comfort Farm. I’m a fairly new podcast listener and I have listened to all your episodes – you are the best!! Your voice is wonderful to listen to and you obviously strive for professional results. I have been thinking about donating for a while but the Brother Amos pattern gave me the nudge I needed. Hope I went through the procedure correctly to get the download – I got my Pay-Pal receipt. I enjoy your musical selections – Whiter Shade of Pale is on my all-time favorites list (although I was considerably older than you when it came out – after all, I have been knitting for over 50 years!!) Also – I was introduced to Enter the Haggis by a teenager in my clog dancing group who has choreographed dance routines to a couple of their songs. Have even seen them in person and hope to again at our local Celtic festival at the end of the month. I’m happy to hear that you are feeling better – keep up the great work!! Thank you for ending with Whiter Shade of Pale. I was introduced to that song in highschool in the late 80’s. I found it a stack of dusty records. I listened to it over and over again with unexplainable nostalgia. I just loved it. Thank you for reminding me. So good to hear the “Brenda” we’ve come to love. Glad you’re here for us! Where can I find the Magic Blanket pattern you talked about? Lord knows I need something else to do requiring more needles/yarn. Another great podcast! I was not a Campfire Girl, but the essay on Brownies hit home with me. It’s been a great trip down memory lane. Thanks also for including Code Monkey, it’s one of my favorites from Jonathon Colton. He is a genius, by the way, and I am forever endebted to you for turning me on to him (via Skullcrusher Mountain). Just listened to episode 54 – a great one. I like your campfire memories, having been a Guide and Guider it’s where I learned to enjoy making things – my first pair of socks (probably aged 15) for my knitters badge and I’m amazed at the people I’ve met at sewing, crafting and knitting shows who’ve been involved with Guides at sometime in their lives. My memory of A Whiter Shade of Pale is hearing it on the radio – my transisitor one – a present for passing my ‘O’ levels – with it on the radiator pipe for good Radio Luxembourg, Radio London or Radio Caroline reception one night. Do persevere with Linux – I’m trying it but not entirely successfully either but i do like the idea of FOSS and the community are really helpful. Many thanks for a really great show. The choice of music, is awesome, as per your usual. Code Monkey was a hoot. Hanging out in the great room, lap top blasting this episode, my youngest child, 14 yo, comes out of her room and asked what I was listening to. Ah-ha, someone new to tell the story of podcasting. I had her listen to Code Monkey and told her about the pod safe music network. Hi, I donated via Paypal on Sept 5th but haven’t gotten the Bro Amos sock pattern yet. I tried to send an email but it kept coming back to me undeliverable. Let me know if I’m doing something wrong. Love the podcast, keep up the great work. Thanks for the inspiration. Oh my god, what an amazing song and singer: Imperfectly Perfect by Katy Pfaffl. Thank you so much for that diamond in an already wonderful hour. slowly catching up on your podcasts, having only just discovered them. I wanted to bring to your attention a wonderful, wonderful husband and wife team, Dee and Tony who dye wonderful, fabulous yarn. I am expecting some fantastic yarn this week myself from Dee. And Dee and Tony are in South Wales, not a million miles away from you. Do drop by her web site and blog. It’s Susan from Lancashire again, thanks for the Procol Harum, I was 6, and I’ve loved getting reacquainted with it. Thanks for sharing your adventures with me.